Origin and Habitat: Conophytum burgeri has a very localized distribution around the mines near, Aggenys, between Sprinbok and Pofadder, Namaqualand, Nortern Cape, South Africa. The strewn valley in which it grows was that used to be the property of the Burger family (hence the name) but is now owned by the Black Mountain mine company who have protected it over the years. Habitat and ecology: Conophytum burgeri grows in full sun in Succulent Karoo vegetation on firm rises where quartz-covered clayey soil occurs. Fewer than 250 plants occurring at a single site are potentially threatened by habitat loss, mining and illegal collecting (gathering) for the specialist succulent horticultural trade. Description: Conophytum burgeri, sometimes referred to as 'Burger's Onion', is a small desert plant that looks like a strange 'strawaberry-coloured' onion and is the oddest member of the genus. It is very slow to clump up; four or five heads being the maximum normally seen in cultivation. Unlike many conophytums (e.g. 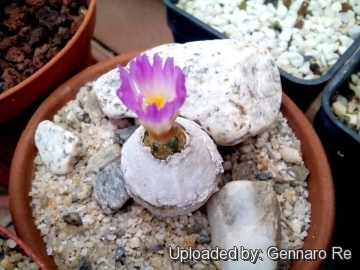 Conophytum bilobum and Conophytum obcordellum) it is a spring and summer growing plant. During winter the plants are covered by a white sheath. Old plants can reach the size of a small chicken egg. Bodies (paired leaves): Solitary, rarely doubled, but up to 5 headed in cultivation, not sunken. Leaves wholly fused 13-25(-30) mm tall, 20-25 (-30) mm in diameter at the base, broadly ovate or conical, flat toward the base and sometimes indented or scalloped around the base, translucent pale grey-green to rich ruby red, shiny, very smooth, covered with persistent white flaking sheaths. Fissure glabrous, short 2-4 mm long often inconspicuous. Flower: Honey-scented purple-rose, long, often splitting the bodies. The calyx-tube is 4-5 mm long with 6 greenish-white sepals with thin margins. The corolla tube (10 mm long) is longer than the calyx tube. There are 24-52 petals (7-18 mm long, 3 mm wide) in a 2-3 series. The petals are rose-purplish in colour and white toward the base. The stamens occur in three series and there are numerous delicate whitish filaments (10 mm long), anthers are yellow. The stigmas (10-14 mm long) are free. Blooming season: Early autumn (The flowering time in South Africa is April-May) Flowers are crepuscular and opening briefly in the mid afternoon. Fruits: 6-locular, sharply pointed above. 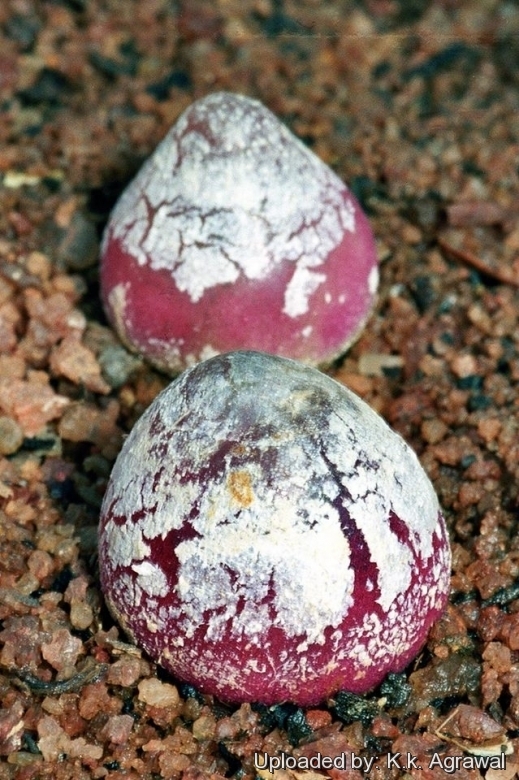 Note: Uniquely in the genus, the cotyledon stage of C. burgeri closely resembles that of Dinteranthus. Cultivation and Propagation: Conophytum burgeri is easy to grow, but like most, it will split and crack if overwatered (unsightly but usually not fatal). These plants grow on spring and summer rain and head for winter dormancy. They like bright sun, cool nights, and plenty of fresh air. Soil: It prefer a very porous potting mix to increase drainage. You can grow a plant in a 6-8 cm pot for years and have perfectly happy plants. For best results, use a shallow pot. Repotting: Avoid to repot frequently. This plant may stay in the same pot for many years. Plants grown in larger containers have frequently relatively poor flowers. It might improve when the plants are given their own, small individual pots. Watering: It requires little water; otherwise its epidermis breaks (resulting in unsightly scars, and are likely to rot). Water throughout the year although minimally in winter, (only when the plant starts shrivelling). For most cultivation situations, this means a light watering every week or so, when the soil is quite dry, during the spring-summer growing period, and nothing but a bit of mist during sunny weather in winter. Exposure: Keep cool and shaded from hot sun in mid-summer; it needs full sun or light shade in the other seasons. Hardiness: Hardy to -2°C. Ensure a very good ventilation. Pest & diseases: Conophytums are sensitive to mealybugs. Rot: Rot is only a minor problem with Conophytums if the plants are watered and “aired” correctly. If they are not, fungicides won't help all that much. Care must be given in watering, keeping them warm and wet while growing, and cooler and dry when dormant. Propagation: It can be reproduced only by seed. The plants are very slow growing, even under ideal conditions, it will take three or four years to get a plant the diameter of a pea, but otherwise not difficult to cultivate. Sowing in early to late summer gives best results. Germination is quick and easy for seed sown on the surface of moist soil, but the minute seedlings have to be coddled along for their first year of life. Water when the medium is just barely dry, and spray lightly with dilute fertilizer every few weeks. Otherwise, seedlings and adult plants prefer similar conditions: bright sun, cool nights, and plenty of fresh air.